At press day, back in April, I asked the Surrey chairman, Richard Thompson what his hopes were for the season. He said it would be nice if Surrey could win the Championship for the first time in 16 years. The inference was that maybe they lacked the maturity to challenge for the title in 2018, especially without Kumar Sangakkara, who hit eight championship hundreds and averaged 106.50 for them last year, prior to hanging up his pads for good. Surrey have used 20 players this summer. Only Rory Burns and Amar Virdi have been ever present and only seven – Rikki Clarke, Jade Dernbach, Ben Foakes, Ollie Pope and Marc Stoneman being the others – have appeared in nine or more of the 12 matches played in the County Championship. It has been a squad performance, with everyone playing their part, no matter how small – whether it was grinding out an important innings, sparking a collapse with the ball or taking a crucial catch; like the one Will Jacks pulled off at short leg to decide an enthralling encounter with Lancashire at the Oval. But at the risk of sounding like the self-appointed secretary of the Rory Burns’ fan club, they really couldn’t have achieved all this without him pulling both the strings as skipper and consistently laying a solid foundation at the top of the order. What makes the part he has played in Surrey’s success all the more remarkable is that he is still in his first year as captain, which, for lesser mortals has often resulted in a downturn in form – ­and all in the absence of Sangakkara, who would not only have supplied a mountain of runs but also been the perfect sounding board for a new man in charge. Burns has made the captaincy his own, but, like all good captains, he has a quality attack at his disposal. If not taking wickets, Morne Morkel has made life extremely uncomfortable for the opposition and, right now, Clarke is arguably the best outswing bowler in the land. It’s just a shame that, at 36, Clarke’s England days are almost certainly behind him. 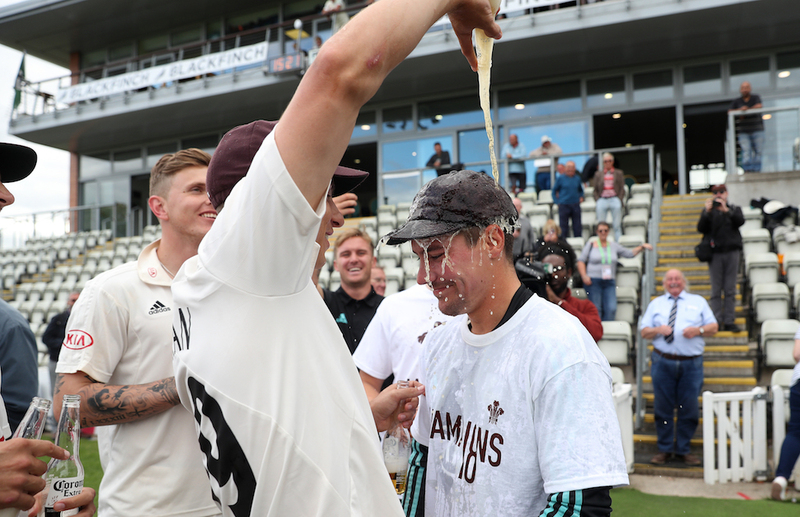 Surrey’s captain Rory Burns is soaked by his team mates after victory over Worcestershire and clinching the Specsavers County Championship title at Blackfinch New Road, Worcester. PRESS ASSOCIATION Photo. Amar Virdi has kept veteran spinner Gareth Batty out of the side and, in recent weeks, Tom Curran has fed off the way Surrey’s bowlers now hunt as a pack. Last year, Curran senior averaged 34.66 with the ball. He could well end this season finishing ahead of Morkel in the averages, and Morkel is currently averaging just 15. The other Curran, Sam, is now a permanent fixture in the England team. Few could understand why he was dropped for the Trent Bridge Test to make way for Ben Stokes. If anything, it made Sam all the more determined to show the selectors what they were missing when he was handed a second bite at the cherry. It meant, though, that Surrey saw far less of Sam Curran that they would have expected. Ollie Pope, who was also given the chance to dip his toes in the water at Test level. In time, Pope, Foakes and, if there is justice in this world, Rory Burns could become England regulars. And so, a year after a third place finish flattered Surrey, with just two wins, in the County Championship, nobody can say their return to the top after 16 years isn’t deserved.